Note: Ray did this trip in 2004. 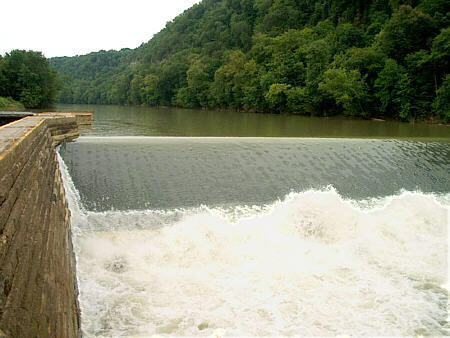 Unfortunately in 2007, the Kentucky River Authority abandoned operation of the lower four locks on the Kentucky River. This means that anyone wanting to explore this river in a powerboat must put in and take out at a ramps between each dam. 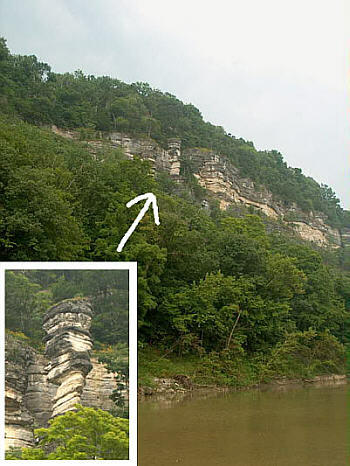 For those who can do that, the Kentucky River is beautiful enough to make it worth while. Paddlers can easily run the entire river by portaging the dams. I have a dream. A dream about the perfect river. Throughout construction of Therapy and since, I have held a picture in my mind of the ideal river for cruising. The banks of my river have steep rock cliffs peering out from tall growth hardwoods that shadow everything but the midday sun. The water is pure and clean and its narrow channel wanders aimlessly for miles unspoiled by industry or development. This idyllic vision is only disturbed by the breaking wake from Therapy's bow as few other boats have discovered this serene waterway. It is mine for the taking. All right, stop laughing, I said it's a dream! Don't you have dreams? Sure you do. No, I have yet to find this perfect river but recently I came very close. 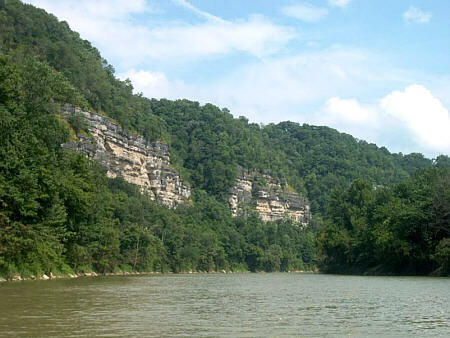 The Kentucky River is a tributary of the Ohio River located west of the Cincinnati, OH area. It runs for approximately 250 miles through the heart of Kentucky. And although it doesn't meet all my criteria it scores the highest of any of my river explorations to date. 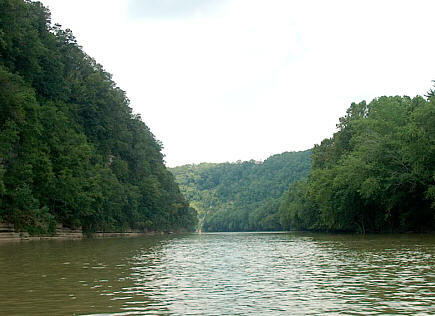 One of the Kentucky River's major assets is also its biggest dilemma. The remote access to most of its pools almost guarantees minimal use. But this was not always the case. 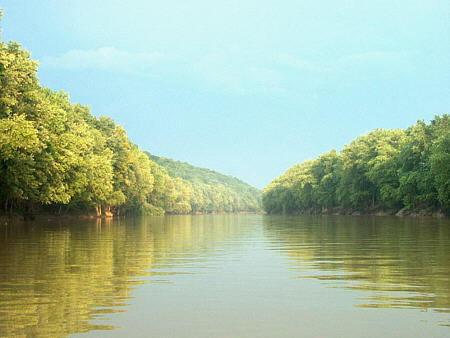 Although most all rivers have a rich history the Kentucky seems to have more than its share. It resonates with the names of early heroes like Daniel Boone and George Rogers Clark. It was important to early commerce by functioning as a natural highway to transport fluorspar, calcite, tobacco and other agricultural products. It also played a part in the Civil War and served both sides of the conflict. It has had record-breaking structures and ingenious engineering achievements. Yet, it also was simply home to many common people whose daily life depended on its continuous flow. 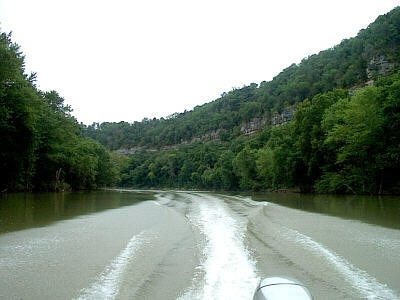 As the population of the area grew the Kentucky River developed in to a vibrant working river with 14 locks and dams. Lock #1 through #5 were built in 1836 and the others followed with the last complete in 1917 (lock chamber at left). They were hand operated and had chambers sized for the day which were 38' X 145' for the first five and then 52' X 148' for the remainder (today most modern locks are 110' X 1200'). Lock #9 was the first all concrete structure, as the earlier ones were stone chambers and wood/crib dams. It appears since there is no longer any commercial traffic on the Kentucky River the Corps of Engineers lost interest in the system. But the State of Kentucky saw the significance and the Kentucky River Authority of the Commonwealth of Kentucky now holds jurisdiction and manages the waterway. All fourteen original locks still exist but unfortunately by 2004 only the first four are in operation and those only on Saturday and Sunday, but they are a treat to navigate. These tiny chambers of hand-hewn stone are some of the oldest operating in the country. They still function by the original mechanisms used for manual operation but have been "updated" and have power assist. The sluice gates (valves used to allow water to enter and escape from the chamber) that were originally opened and closed with T handles or wheels driving screws now have hydraulic pumps and cylinders that lift them. The miter gates that were opened by walking in a circle pushing a bar that turned the rack and pinion gear set now have an electric motor driving them. At least I thought it was a motor. I noticed the lockmasters reaching under a canvas cover and presumably pressing a switch. In fact, all the operating locks use large commercial Milwaukee drills as drive motors . At one of the locks the operator was kind enough to allow me the experience of opening a gate with this somewhat jerry rigged setup. It worked surprisingly well even though the drills seemed to be really loaded while completing the task! The lockmaster admitted they burn out a drill from time to time. Another item of interest to me was the pool level indicators at each end of the lock walls that were beautifully carved into the stone. One was even in Roman numerals. It just helped echo the craftsmanship that went into building these 168-year-old structures. 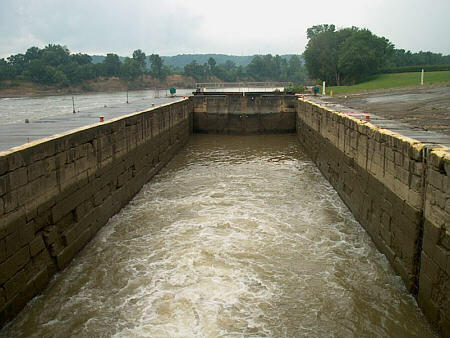 The operating locks allow access from the Ohio River and up the first 83 miles of the Kentucky. Because of the limited access I needed a different plan of attack to experience this river. Normally I would just dump Therapy in the water and go but this time without all the locks operating I would have to trailer from pool to pool. Some serious planning was needed to try to minimize the tow miles so more time could be spent on the water. I used a couple different computer-mapping programs to help me decide on the best routes. To assist in this I did a web search and found a site by the Kentucky River Authority that listed all the existing boat ramps on the river. This was a huge help. I also had a copy of the Kentucky River chart and between the two was able to form a decent itinerary. I decided to start at Frankfort, KY and first travel the pools with working locks. 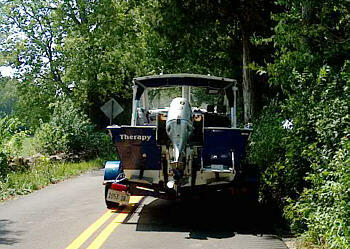 The ramp listing showed one of the ramps in the Frankfort area to be at the Frankfort Boat Club on Wapping Street. I decided this one would work well for me but when I got there I realized it was not easy to find. It is unmarked and out of site from the road. The one-way road leading to the ramp is immediately to the west of the St Clair St Bridge. Leaving the ramp you exit into a city parking lot. There is a fee for parking during the week but weekends are free (ramp use is also free). I arrived late Friday night and decided to sleep in Therapy on the trailer on the city parking lot. This worked but was not ideal. The St Clair St Bridge is very near by and is constructed with a metal grid type surface rather than concrete or blacktop. This is extremely noisy when cars passed over it. But I was tired after the six-hour drive and slept fairly well. The locks were operating from 10:00am to 8:00pm on Saturday and Sunday. Since I was up early and the first downstream lock was only a mile away, I decided to go upstream the 16 miles to Lock #5 (non-operating) and then return for the run to the confluence with the Ohio River. Once underway I am struck by how narrowness of the river. Normally it ran about 200' wide but at some places it is only about 150'. Next I was surprised by the homes along the shore. Frankfort is the capital of Kentucky so obviously a city of some influence. Normally I expect to see the river front property in a city owned by the more wealthy class and homes that match their life style. But here it wasn't the case. Most all of the homes and cabins were modest. Not that I see this as a bad thing. It is nice to see that average people like me have a shot of owning property on the water in this area. The shore lines of the river are covered with trees and normally at least one side is a steep bank if not vertical of at least 100' tall (photo at right). Some places are much higher. Because of the shelter provided by the high banks and the winding nature of its course the wind has little effect on the water and it is often like glass. At the time I was making my trip the waters were receding after being high as result of heavy rain. That in turn not only made it a little cloudy but also was delivering the normal fare of river junk. Not a lot and nothing large but enough to annoy and somewhat distract my attention when I would have preferred to be just looking at the countryside. The weather was great with the high temps at about 85 and lows in the low 70s. The humidity though was very high and I saw short rain showers several times most every day. But that is exactly what I built Therapy to handle. Rain doesn';t slow her down or detract from the cruise as we can continue to just plug along and enjoy the ride while I am sitting dry comfortable. The locks all monitor channel 13 on the VHF radio but usually they are not needed. The lockmasters seem to keep a close eye on things and start to cycle the lock when they see you approaching. They were all very pleasant and willing to talk about the locks, their history and in general what was happening in the area. They offered advise on the river ahead and pointed out any possible problem points (river snag) as well as reminding me of their hours of operation to make sure I didn't get caught where I didn't want to be. The 82-mile ride to the Ohio River at Carrollton, KY was wonderfully uneventful as I only passed three other pleasure craft making their way up stream. I didn't have the river completely to myself but certainly it was close (photo at left). The Ohio River was a different story. It was mid afternoon and the river was alive with jet skis, sport boats and barges. Just as I entered the mainstream a group of six go fast boats with through the transom exhaust hammered the throttles in unison and created noise surpassed only by a space shuttle launch. I have never figured out the logic of going out into a serene natural setting and then finding pleasure in creating pointless racket. They may love the sound of the V8s screaming but others with in three miles may not share their enthusiasm. If I decided to drive may pickup up and down the streets in my hometown with open exhaust, rattling the windows of homes and business I would be quickly arrested for disturbing the Peace. But somehow it is different on the water. One author in a boating magazine commented that the guys (and it is ALWAYS guys) that operate these boats do so as a desperate cry for attention. Can't say I disagree. (OUCH! I just hurt myself when I fell off the soapbox. End of rant, back to the Kentucky River). Carrollton has a public dock and ramp available at their riverside city park but there was a Blue Grass Festival going on. That combined with the Saturday boat activity sent me upstream a little farther looking for a suitable place to anchor and go ashore. Rock and other debris littered the shoreline so I used my Anchor Buddy (bungee cord for anchors) to allow me to get to shore but then have it pull Therapy back away and float in deeper water. I walked up to the business district to scout out local restaurants and then explored a little more of the town of 3800 people. As I strolled around town the high humidity and full sun caused me to work up a sweat so I decided to return to Therapy and take a swim to cool down. The water in the Ohio was about 76 degrees and actually a little clearer than the Kentucky so I decided to breakout the soap and shampoo. On the Kentucky there are only a few marinas and none with shower facilities. In these situations using the river as a bathtub is the only alternative to offending everyone that comes within 10 feet of me. While in the 5' water I walk around Therapy and run my hand over her bottom. I am amazed after all the hits the surface has taken over four years I can feel no cuts, scrapes or damage. The rivers certainly have tried to abuse her but she obviously has the right stuff. With the personal hygiene activities complete I find I still have an hour or so before I want to have an evening meal. I drag out my lawn chair and a good book and relax while reading and watching the river activities. Not a bad way to spend an afternoon. Fortunately, it is Saturday or I might have felt really guilty about kicking back like this while my wife was at work at our office. But alas, I knew today without me she would be enjoying herself by hitting all the area malls. How about that - it's a win/win situation. About 5:30 I decide to walk up to the Riverside Restaurant that offers a view of the river. As I start to go ashore I noticed the sky to the west darkening a little so expecting another shower I grab my umbrella. In the restaurant I take a seat that affords a view of Therapy bouncing happily in the wake of passing boats. A few minutes pass and I am busy checking the menu and placing my order. When I look up I realize the wind has really began to blow and the trees are whipping back and forth. I immediately look at Therapy and get a knot in my stomach. The bungeed anchor off the stern had not held in the wind and Therapy had been blown next to shore and was banging up and down on a large rock. I jumped from my seat and on the way out the door told the waitress I would be right back. I ran down to Therapy and jumped right into the river and pusher her off the rock. I then quickly got in and fired up the Honda 50 and backed away until I pulled the bow line (attached to an anchor wedged firmly in rocks on shore) tight. Now what? I tried twice to set the anchor off the stern but both times it failed to catch and I drifted towards the rock that lay there ominously peaking out as each wave passed. In the back of my mind I was thinking about the waitress and wondered if she thought I skipped out. After about 10 minutes of messing around the wind receded a little and on the third try the anchor finally stuck. I waded back ashore and sloshed back up to the restaurant. My sandwich was waiting and I nervously ate it as I continued to monitor Therapy's position. I hadn't taken time to inspect the damage. Right then I just didn't want to know. 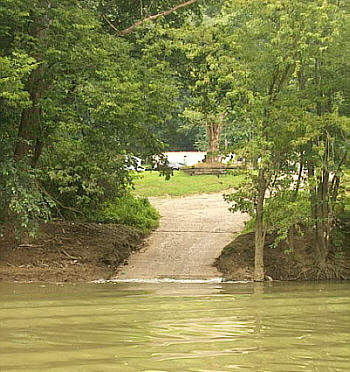 I finished my meal and decided to start back up the Kentucky River. I had to wait for a few minutes at Lock #1 for a boat coming downstream (my only wait at all the locks) and made it through Lock #3 before dark. The current was low and I decided to moor to a dead tree near the shore. An anchor off the stern kept me off the bank and I enjoyed an extremely quite night floating on the calm water. The next morning I cleared Lock #4 with no problem (at right is the dam adjacent to the lock) and found myself back at the ramp where I had started the morning before. As I loaded Therapy on the trailer and pulled into the parking lot I noticed a man and wife team cleaning up their 24' Tom Cat. When they saw Therapy the mistook her for a C-Dory which made me smile a little to myself since that was the look I was trying to capture when I built her (C-Dory and the Tom Cat are made by the same company). I explained the same to them and we chatted for a while about our boats and different boating areas. They were from The Lexington, KY area and cruised the Kentucky often. I ask about the upper Kentucky and they told me at least to be sure to see pools #6 and #7. They said they were well worth the drive. The ramp for pool #5 was about 20 miles away (shown at left). Like many of the ramps allowing access to the upper pools it was privately owned. Fees for these ramps where handled by placing $4.00 or $5.00 in a drop box. All of the ramps I used were hard surface but rather narrow. If doing a two person launch where the boat could be backed off and then the partner pulls the trailer forward making room for the boat to run up on the ramp, this would be no problem. But I was alone. Often I had to really work to get the trailer to the very edge of the ramp trying to leave enough space to nose Therapy in along side. Naturally, the current or wind would then try to swing her around into the trailer or shore. Made things interesting. The ramps weren't the only things narrow. First I want to comment that ALL of the roads I traveled in Kentucky were in excellent condition. Even the out of the way, in the woods, down by the river, back roads were blacktop and extremely smooth. BUT WERE THEY NARROW. You certainly can't accuse them of wasting blacktop. Some of the roads were striped as two lanes but in Illinois they would be considered a decent single lane. And there were no shoulders. On one of the narrower sections I couldn't help myself and had to hop out and take a photo of the trailer (at right). Although it is a little hard to see the right wheel is on the very edge of the blacktop. And the left wheel, well??. I really liked the warning cuts in the road edge that give an audible warning you're too close. Your ALWAYS too close! Pool #5 was one of the shorter runs at 14 miles long. It provided some nice scenery and again a distinct lack of other boat traffic. When I reached the decommissioned Lock #6 I founded that it was silted in near the miter gates but I was able to moor at the end of the longwall and climb up the ladder for a look around. There was a fisherman on the lock wall and we talked a little about the lock and the area while we watch gar swimming around in front of the gates feeding on the thousands of minnows that made the water boil. He gave me a suggestion as to which ramp to use for Pool #6 and I took note. It wasn't long and I was back loading Therapy on the trailer and hitting the road for the next pool. I took the fisherman's advice and used a county ramp that not only wider than most but free. Again, my truck and trailer were the only ones in the parking lot. Pool #6 is 21 miles long and its first seven miles or so are similar to earlier ones. But then things start to change. The cliffs start to climb and their rock faces begin to dominate the scenery. It was at this point I realized I had left my camera in the truck. I thought about just forgetting the photos but the more I looked the more I wanted it. And I remembered the couple at Frankford telling me that #6 and #7 were the most enjoyable. Back seven miles to get the camera, and I am glad I did. Nine miles upstream I come to Cummins Ferry Marina - a small but nice facility with a good ramp. 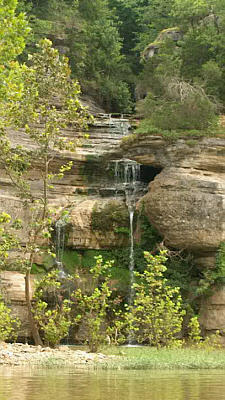 Directly across the river from docks is a rock cliff with small waterfalls (shown at left). And from there on up the pool the river provided truly outstanding views of the Kentucky countryside. At mile marker 113 the river becomes even more of a treat as it offers a first for my boating experiences. 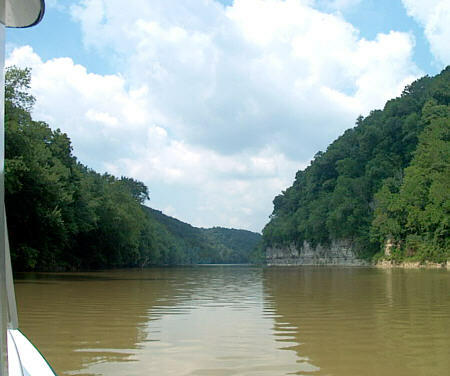 The Kentucky becomes a self-guided tour for the next 62 miles. When I was at Lock #1 the lockmaster had given me a 25-page brochure and map prepared by the Jessamine County River Task Force. As you travel this section of the river there are numbered signs along the shore that corresponds with the map and text and offers interesting tidbits of river history and a few current events. This is a unique and cleaver device to enhance the experience of the river. I will mention I couldn't locate a few of the markers but I attributed that to the higher than normal water levels and the fact that they were probably submerged. Pool #6 ends at Lock #7 and again I go ashore to have a look. This time I pull in a little downstream and walk to the lock and dam. 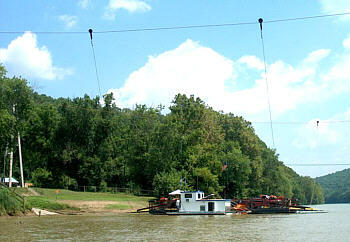 I note that it has a small operating power generating plant, the first I had seen on the Kentucky River. A sign states that it is totally automated facility and list the times of the day when water is released. This serves as a warning to fisherman that often work the tail waters. I make the return trip and once again enjoy the panoramic view. For me I just doesn't get much better than this, or so I thought. The next stop on Pool #7 was 25-mile drive to the ramp at High Bridge (shown at right). 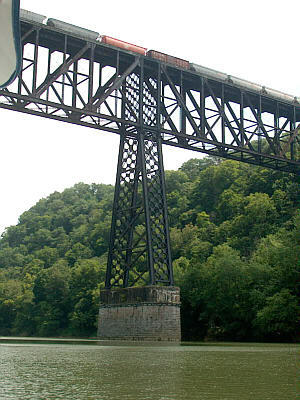 The brochure explained the name was derived from a railroad bridge constructed there in 1876. At the time of construction it was the highest bridge in the United States and although it as been refurbished to handle the weight on modern traffic it still towers over the river. A half-mile upstream from there is the Shaker Landing where an operating paddlewheel tour boat is moored. Nearby is Pleasant Hill, a restored Shaker community open to the public. And the scenery continues to get better as the cliffs grow and wrap 180 degrees around tight hairpin turns (photo at left). Extraordinary!!!.. Then another 1/2 mile about mile marker 131 is Chimney rock (called Candle Stick Rock on the chart) a unique geological formation. At mile marker 135 is Camp Nelson. Today there are RVs along the shoreline but during the Civil War this area was a Union camp. It is of note to me because of an interesting engineering achievement. Five miles upstream the Union army built a waterworks. A stream pumping station was built on stilts 35' above normal pool and pumped water from the river 470' up the cliffs to a reservoir on top the bluffs. From there the water was gravity feed through out the camp that was about 1 1/2 miles away overland. Not bad for 1863. All the way to Lock #8 the extraordinary views continued. I stopped to check out the lock but didn't stay long as I was anxious to make the return run. At one point I brought Therapy to a stop and just drifted in the lazy current while I gazed up at the sheer rock walls. It was so quite and peaceful it is hard for describe. For me one of the biggest draws of my river trips are the solitude sometimes found so here on the Kentucky River I was in heaven. I know it sounds silly but at one point I remember noticing my cheeks starting to hurt from smiling so much. This indeed was the most enjoyable river passage I have yet to make. As I was leaving the ramp area I decided to swing into High Bridge Park on the bluff overlooking the river. I found it to be a small immaculate park giving and excellent view of the bridge and the river below. There was a large open pavilion with a hardwood floor and ceiling fans, smaller picnic shelters, observation platform and grass-covered areas all beautifully maintained. I explored one more pool of the Kentucky River. Pool #9 didn't offer the extraordinary landscape like #6 and #7 but still a great run. One point of interest was at the 158-mile marker where the Valley View Ferry is located (shown at right). It is the oldest operating ferry west of the Appalachian Mountains and the oldest continuous operating business in the State of Kentucky. It also operated in a different fashion than other ferries I have seen. Propulsion is provided by a small paddlewheel tow attached to the side of the ferry but it does not pivot at the bow to push the ferry from shore to shore. Instead the paddlewheel is just placed in forward or reverse. It provides the power but does little or no steering. Directional control is mostly maintained by attachment to cables strung from one bank to the other. Time has proven this method as it has been working in this basic form since 1785. By now the time I had allotted for this trip was running out and it was time to return home. I was facing about a six-hour drive with Therapy in tow but the visions of the time on the water still swirled in my mind and made it seem much shorter. I had taken over a hundred photos during the four days I had spent on the water but somehow the pictures don't do justice to what I had experienced. It is sort of like taking photos of the Grand Canyon (like the one at left), they provide the image but just don't convey the depth, the feel or the awe that witnessing it first hand provides. And Therapy once again delivered me to and brought me home safe and sound without a complaint. It is truly amazing how much pleasure this little wooden boat has brought into my life. I finally forced myself to check out the bottom where she bounced on the rock but other than the paint being scraped a little she was just fine. A tough old girl. Like me though, she is starting to show a little wear with a scratch here and there and a little minor dock rash but over all not bad. Especially now since she has 15,094 miles and 903 hours running time on her. This trip added 350 miles and 19 hours of those totals. It was a great trip and I will do it again someday. And although maybe not my "dream river" the Kentucky River is certainly one to remember.